Murder by Gaslight: Did He Murder His Namesake? Did He Murder His Namesake? 28-year-old Cornelius Callahan and his 23-year-old cousin also named Cornelius Callahan, took a train, on October 24, 1883, from Hartford, Connecticut to Meriden, Connecticut where Daniel Callahan, the brother of the elder cousin had a job opportunity for the younger. After transacting their business, the three had a few drinks before the cousins took the limited express that evening back to Hartford. When the train arrived in Hartford, only the elder Cornelius got off. The arriving Cornelius Callahan told the family that his cousin had been standing on the platform outside of one the cars and had fallen off the train near the town of Berlin. He said he told the conductor and a porter, but was not believed. The family was also slow to believe this story, but the following day the brother of the missing man and the father of his cousin, walked the track near Berlin. They met a crew of railroad men who said they had found a body underneath a pile of crossties; it was their missing relative, almost exactly where Cornelius had said it would be. As more information was gathered, the case grew increasingly mysterious. The young Cornelius had died from a stab wound to his side which the coroner concluded had been inflicted by a knife. Aside from some minor bruising, the had no other injuries. It appeared as if the body had been stabbed and dragged to the place it was found, but rain fell that night and would have washed away any signs on the ground to verify this. The train that the two men had allegedly taken made no stops between Hartford and Meriden so the dead man must have fallen from the train. But the body was found near a sharp curve in the track known as Kelsey’s Corner, and the train took the curve at a speed of at least 50 miles per hour. The body should have sustained more injuries. The surviving Cornelius said that they had bought some dried beef and crackers and had gone out on the platform to eat them in private. A conductor recalls seeing two men on the platform and telling them that they had better come inside. Another conductor remembers some passengers saying that a man had told them that someone had fallen off the train, but he appeared to be crazy and they thought it was a joke. A porter remembered a man who claimed someone had fallen off the train, but the porter was reluctant to talk about it, and he was briefly considered a suspect. It came out that the two Callahan cousins had not always been on the best of terms. Their fathers had been involved in a lawsuit over the ownership of a small piece of property, and the animosity had spilled over to their sons. There were reports of heated arguments between the two boys where, at least once, the elder had threatened to kill the younger. This, along with inconsistencies in his stories, made the surviving Cornelius Callahan the prime suspect in the murder of his cousin. He was arrested and taken to jail in Berlin. As the New Haven Register reported, the case had “more theories than facts.” Coroner Bollmann of New Haven, who had gained distinction as the coroner in the murder of Jennie Cramer, believed that the death was accidental. The cousins had been eating on the platform, and when the train rounded the curve, the younger Cornelius lurched into the other. He was accidently stabbed by the knife his cousin was using to cut the beef, then fell off the train. But the accused swore that he was in the smoking car while his cousin was standing on the platform and he did not see the fall. Another theory speculated that the fall had not killed the victim and a tramp near the tracks stabbed him and dragged the body to the crossties. Others believed that they had taken a different train and had gotten off at Berlin, where the two cousins quarreled and the elder stabbed the younger, but Daniel Callahan insisted that he had seen both men board the limited express which made no stops between Meriden and Hartford. On October 31, 1883, the case went before the grand jury to determine if Cornelius Callahan should be charged with murder. The coroner asked for a continuance because he was not ready to proceed, but Callahan’s attorney protested saying his client was a poor man and could not afford the delay. However, he said he would agree to the continuance if the state agreed to four points: 1. That the prisoner and the deceased left Meriden together on October 23, on the limited express after buying crackers and beef, 2. That the train did not stop between Meriden and Hartford, 3. That the prisoner told the conductor and porter that his cousin was missing, 4. That the prisoner had been in Hartford all night on October 22. The prosecutor would not agree to these points but did agree to pay witness fees to the accused. The state had wanted to charge Callahan with premeditated murder, but ultimately the grand jury decided that there was not enough evidence. He was to be tried, instead, for manslaughter. Cornelius Callahan may have pled guilty to the lesser charge as it does not appear that a trial ever took place. “The Callahan Murder,” New Haven Register, October 29, 1883. 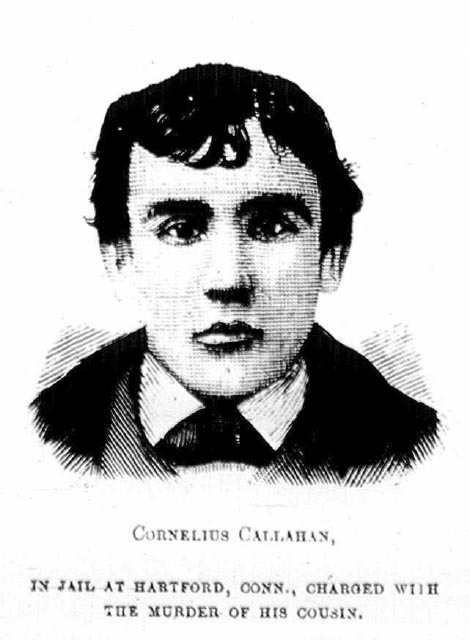 “The Callahan Murder More Theories than Facts,” New Haven Register, October 27, 1883. “Connecticut,” Springfield Republican, November 9, 1883. “Coroner Bollmann's Theory,” Boston Herald, October 31, 1883. “Did He Kill His Namesake?” Boston Daily Globe, October 26, 1883. “Did he Murder his Namesake?” National Police Gazette, December 1, 1883. “Investigating the Murder of Cornelius Callahan,” Boston Herald, October 27, 1883. “Murder on a Train,” The Sun, October 26, 1883. “Not a True Bill,” Boston Daily Globe, December 8, 1883. “Undoubtedly a Murder,” New Haven Register, October 26, 1883. “Was it Murder?,” Boston Herald, October 26, 1883. Creepy looking man. Good story.